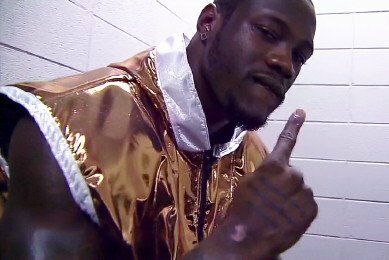 By James Slater: As has already been reported, unbeaten 26-year-old heavyweight contender Deontay Wilder will make a quick return to action fowling his recent 1st-round KO win over Kertson Manswell. “The Bronze Bomber” now has an opponent: according to Golden Boy match-maker Eric Gomez, who spoke with Ringtv.com, Wilder will look for his 25th KO win in as many fights against 39-year-old Damon McCreary on September 8th, in a fight that will go out on Fox Sports Net. McCreary, known as “Bulldog,” has a good looking pro record at 14-0(10) but, his age aside, the Detroit fighter has a number of things going against him heading into this, the biggest fight of his career by far. Number one: McCreary is just 5’11” (compared to 6’7” for Wilder) and he has had just one fight as a heavyweight – his last fight, when he came up from 185-pounds to scale 230 for his November 2010 points win over Raymundo Lopez. Number two: McCreary has been inactive, with just one bout since 2007, this being the 2010 win and three: McCreary has never before met a fighter as good, as powerful and as talented as Wilder. Add it all up, and it looks like yet another ultra-quick win for the 2008 Olympic bronze medallist. Wilder, though, is keeping very busy and he has called out bigger, better names than McCreary, who has had who knows how much notice/time to train for the fight that will take place a week on Saturday. Wilder says he wants Tyson Fury, yet argues how the unbeaten Brit is afraid of taking him on. Who knows for sure what the real story is? And so, as he awaits his breakout fight (which promoter Oscar De La Hoya says will happen some time soon), Wilder, 24-0(24) stays active against the likes of McCreary, a fighter who began his pro career as a 166-pounder. Unless I’m paying McCreary a major disservice and he is way tougher than expected, fans who attend this fight can be expected to go home early. Look for Wilder to score his second 1st-round KO in a row; the fifteenth of his pro career so far. Staying busy is a good thing for any young fighter, but Wilder MUST face a legitimate top-20 guy soon. After all, come November of this year, Wilder will have been a pro for four years. Next boxing news: Alvarez-Lopez: What chance does Josesito have?